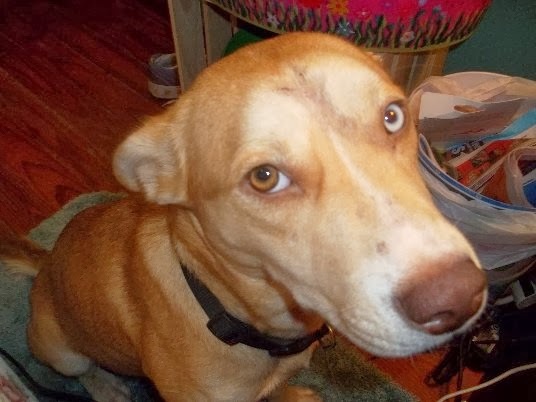 This precious dog was beaten with a pipe as her human Mom was stabbed to death. Please help Golden Girl find a new home. *From Parker: The one blue eye looks like could be some Husky there....or herding breed??? very beautiful girl what ever she is...6-8 months will be spayed. Folks this is from a very dear lady that I know. Ms. Martha is the one whom rescued Maggie Mae. Folks please read below and share this dear dog's story in hopes of getting a rescue or forever home. This is an awful tragedy for any dog to go through. I have a very special girl and seeking help finding a home. If you are local, you are familiar with the young lady that was recently stabbed to death while at work at Wendy's in Magee. Her boyfriend, her child's father, killed her. This sweet, very timid dog belonged to the deceased. The boyfriend also abused this dog. She has a dent in her head. It broke my heart when I saw her, she has the same dent as Maggie Mae (Mary picked Maggie Mae up for me, her owner beat her with a steal pipe in the head and went to jail). I call this little lady Golden Girl. I know very little about her. I believe she is about 6-8 months old. She is very sweet and scared. 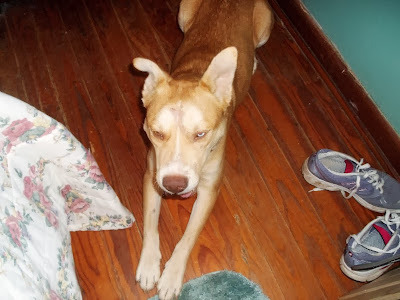 I am attaching photos and will get her spayed ASAP, and a complete examination.